An exciting community project between artists Lara Harwood and Zoe Payne with the residents and children of Tottenham Hale. Commissioned by North Tottenham Townscape Heritage Initiative, Haringey Council’s £2.3 million project to restore 28 historic buildings along the High Road, supported by the heritage Lottery Fund an local businesses. This is an arts project celebrating life on Tottenham High Street and its evolving trades. Mixing words, sounds and objects from its bustling Victorian past and its lively present. Lara and Zoe ran a series of workshops with local students from Harris Primary Coleraine Park and Risley Avenue Primary at Coombes Croft Library and Nortumberland Park Residents Association. The workshops explored Victorian typography: stencilling and monoprinting words and phrases from then and now. Magazine collage was also used to playfully explore the shape and textures that you could have found and can still find on the high street. 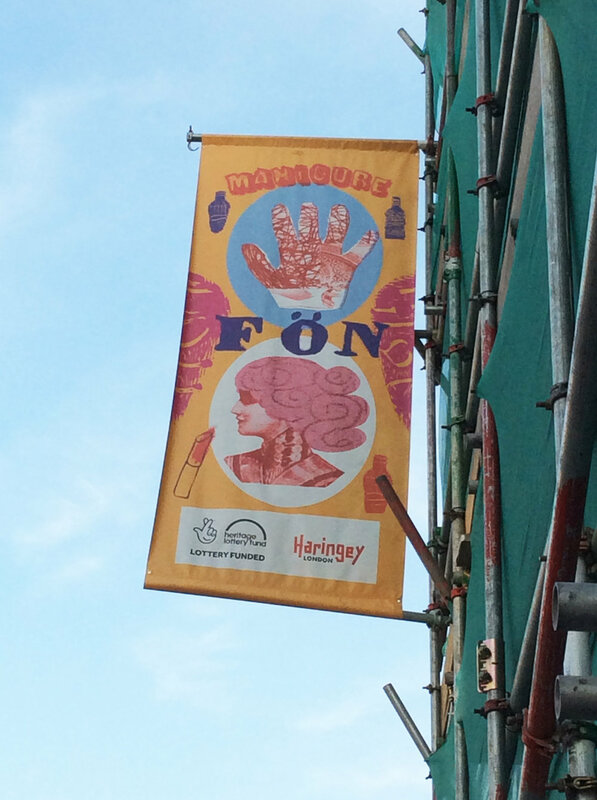 Lara and Zoe created six banners using the artwork created by the children: each banner is based on a real site or store on the high street: a Beauticians, a Barbers, a Grocery Store, a Pub, a Cafe and a Cake shop. To learn more about the project andwonderful Victorian imagery and language- check out our..
With Special Thanks to Natasha Johnson of Tottenham Regeneration and Eleni Markou of Coombes Croft Library and all the wonderful volunteers who helped with the workshops. Thank you to Heritage Lottery Fund and Tottenham Grammar School for their support.